Communication is part of being human. So if we lost the ability to speak would we be able to communicate? Yes. If we lost the ability to see would we be able to communicate? Yes. If we lost the hear would we be able to communicate? Yes. If we lost the ability to feel would we be able to communicate? Yes. If we lost the ability to reason would we be able to communicate? Yes. If we lost the ability to dance would we be able to communicate. Yes. If we lost the ability to think would we be able to communicate? No. Probably not. Mm…. When we communicate with another person do we really convey what we want to say? Do we know what we want to convey? Does the other person listen and understand? Is it important that the message is conveyed and understood? Is one thought conveyed more important than another thought? Does it really matter? Is language enough to convey our thoughts? Is one language better at conveying emotions than another? Do we really need to speak to communicate? Sometimes silence when sitting with another speaks volumes through other communication. Is body language enough? Isn’t love, unconditional love enough? Communication all comes down to sharing an experience. Having an experience on our own we believe maybe more memorable or enjoyable if shared with another. Whether it be a spouse, a child, a parent, family, friend, stranger, pet or animal. We like to share whether we admit it or not. Even the grumpy old codger down the street, you know the one that never smiles. He also likes to share too. Sometimes it has been so long since we shared that we no longer know how to. We believe that we may get hurt if we share and are misunderstood, laughed at, or even ignored. We would prefer to not try than face rejection. Nuts. Nuts and more nuts. Never stop starting. Wrinkles are lines on the body, some are from the sun, others from laughter, others from hard work, sweat and tears. They are a part of us, our history whether you believe in astrology or not. We should cherish them. As we get older we gain more along with wisdom. Gravity takes over and things which were once up become down. That’s life. We cannot change that naturally. We can in moments. We can with memories and photographs, music and film. Life is an illusion and it is what we see it is. Pain aside. I am not saying pain and illness is an illusion but our view on the world is an illusion. It is what we perceive the world to be. It is never worse than you think, nor better than you imagine. Mostly life is ordinary. Ordinary is not dull, ordinary is not boring. It is as it is. Amongst the ordinary is the extraordinary and in those moments we need to use the conserved energy stored during the ordinary in order to embrace the extraordinary. Sometimes we deal with stoic numbness, other times we weep and wail, other times we shout with joy, sometimes we pee our pants or snort in fits of laughter. We are not superheroes, we are human. We are not perfect. We are ordinary. We are not special. We are here to make the best of it whichever way we see fit. Sharing our tears, wrinkles, sweat and joys is all part of the ordinary. For the unobtainable happiness of desire, to the endless want of more, more and more, the “never be full”, just you remember the glass is always half full, you can never achieve the full glass. The joy is in the half full glass. The joy is in the contentment with the half full glass. The contentment of what you have and whom you share it with. The time you spend sharing with someone. Spending time with someone doesn’t always involve spending money, it is being present in the moment. Fully listening to them. Sharing the time. Even if you don’t understand what the person is saying, you can listen, you can be there for them. You don’t even have to speak. You can just hold their hand or just be there. Texting online or video chatting is sharing too? Some may say that it is not quality communication. But that is just one opinion. Times are changing. Physical isolation is now no longer a barrier to communication with satellite and wifi internet, air travel routes to most of the globe. You can no longer hide under a rock. Someone will find you whether you like it or not. Cheers, nuts and wrinkles to you all! Are the unread books on your shelves just as important as the ones that you have read? Do you have the time to read? Name one unread book on your bookshelf. How do you chose a book to read? Do you buy them online? Kindle version? Go to the library? Don’t bother? What language do you read books in? Do you prefer to read in the author’s native tongue or do you read the translation? Have you ever ordered the same book twice? Do you own the same book in different languages? Do you prefer first editions, hard covers, paperbacks, kindle, don’t care? Do you let books go or do you hang onto them? Do you lend books out? Or guard them with your life? Do you dust the shelves? How do you arrange your books? Alphabetically? Dewey Decimal? Grouping of interests? Height? Do you ask friends for recommendations? Do you read blogs, the online selections for ideas? Do you read sitting in a chair, lying down, on a sofa, on a daybed, in the sun, by the fire? Do you fall asleep while reading? Do you read lots of books at the same time or just the one? How do you mark your page to continue reading? Can you read in public, in airports, in cafes, at the beach? How do you feel when you get to the end of a good book? 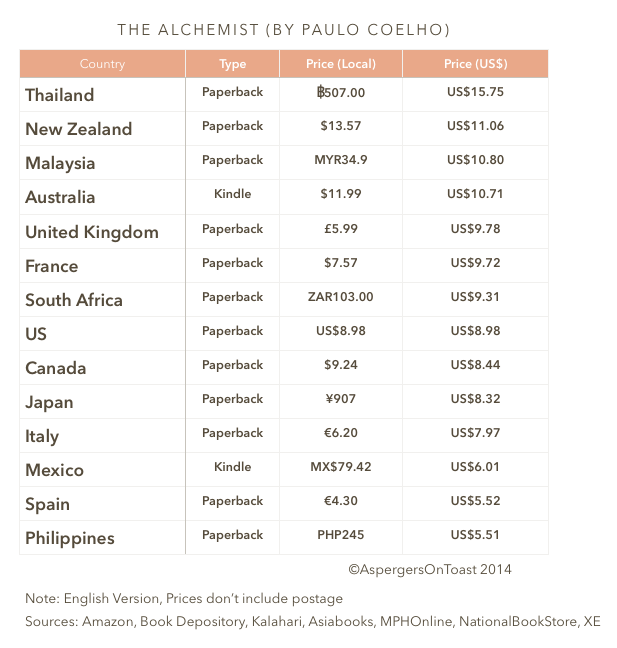 Why are books more expensive in some parts of the world? Such a fine speech, so eloquent, so British, so honest. Her words were heartfelt, her nervousness was just enough, she shone. Resistance is futile. This is what I told myself. I am going to exercise whether I like it or not. I have been walking five days a week. By walking I don’t mean power walking, I mean parking the car at the furthest spot in the car park. I mean going to two or three places and walking about and going home. I’m moving. We have been doing this for about a month and the effort is paying off. The fresh air, the forced interaction with people is pleasantly surprising. Stationary Bike is next. So far three days in and going strong. Twenty minutes is where I am starting at and after a month I will see how I feel. Exercising as soon as I wake up lifts the guilt on will I or won’t I exercise. It’s done and out of the way. The act of exercising for me at the moment is not fun. It is a chore. It is something to do to get better physical and mental health. It seems to be working. If it only gets rid of the guilt that is more than enough. “Shows a reluctance to continue despite…..” numerous attempts at walking and the cycling machine. I am back to square one again. I was trying to combine walking and cycling but I am back to just walking. Walking 4,000 steps is my daily goal. I read somewhere recently that if we change the word from “goal” to “promise” the intention becomes more personal and we have a greater determination to keep your promise. Do you agree? My goal is to walk 4,000 step every day. I promise to walk 4,000 steps every day. Does that really make a difference? If I wrote it down longhand, with paper and pen would it become even more personal and make an even greater difference? Does adding “I” into the sentence make a difference or is it the word “promise” that makes the difference? Or does it not matter at all? Some days I don’t feel like doing anything and other days I could walk forever. My best will not be the same each day. What I mean by that is on a good day the effort to walk 4,000 is so easy, yet on a reluctant day the number 4000 may seem unreachable. The effort for the good day will be less than on the bad day despite the number of steps being different. Just looking at the numbers doesn’t tell the whole story. Only I know my best. That being said the point is not to use up all your energy on a good day. Conserve your effort so that you may continue the next day. If you decide that you are doing so well you decide to walk 10,000 steps when your average is 4,000 steps then you can imagine that your body will be tired the next day. Isn’t it better to do 4,000 consistently instead of bursts of energy followed by inactivity? I am on the fence with goal setting. I no longer make New Year’s Resolutions. I don’t see the point in making a resolution that will not be fulfilled. I used to write a long list of things on my list. But the disappointment of not completing the tasks became more than the reason for writing them in the first place. However I do use a calendar and write down things to remember. I have to do lists. I am trying to set up a routine so that my habits become automatic. This is a work in progress. I think my goals may not be written specific enough. That’s why I am on the fence. I let my imagination run wild and I come up with six cards. Now on these cards, hand written cards, I have a mentor’s photo and name written in the top left hand corner, and I write the goals on the right hand side. Each card represents a different aspect of my life. For example, Christine de Pizan (1364 – c. 1430) is one of my mentors. Yes, she may be dead but she inspires me. I still consider her a mentor or guide. It may be stretching the boundaries of the word mentor but that works for me. I also try to find female mentors where possible. I write down what I would like to achieve. On paper my goals look great. They are grand ideas. They are good ideas. Some people say that you should write your goals down. I’ve done that. Others take it a step further and say you should verbalise your goals to others. This part I am not so sure if I agree with here. If you state your goal out loud to someone then you have an increased feeling of pressure. For some people that may be encouraging, for others it is a burden. You know when you announce that you are going to do something and then you don’t do it, you know the feeling when you are asked about it later, and you have to say, well actually I didn’t do it, or I didn’t finish it or I’m doing something else now. It embarrasses both the person asking and the person replying. I think after trial and error that stating goals on paper is better than verbalising. People have been known to cheat and bend their own rules in order to complete their goals. Results get made to fit the hypothesis. Sometimes the results should be surprising or unexpected. Only we know if we have completed out goals properly or not. I’m not sharing the goals on my cards for the very reasons I have mentioned. But what happens if you are stuck on the journey and you don’t know how to proceed? Say a fork in the road, at a roundabout with multiple exits and you are without a road map or snowed in for the winter. That’s when it gets tricky. Maybe you wrote down a goal that wasn’t specific enough. Maybe you need to tweak your goal with more precise language. This is when I think you need to break down the BIG GOAL into many little goals, or baby steps on the way. Maybe you need to add deadlines to your goal. Always review your goals. You may decide that your goal is no longer relevant to your life and it may no longer serve its purpose. Time to make a new one. Sometimes we may just need a reminder of what we wanted to do after becoming sidetracked with life. My cards look great and already one mentor is going to be replaced. I need to find a replacement. I want to break the goal into smaller goals and set myself a time limit. I may have six cards but that doesn’t mean that I am chasing six tails. I am not juggling at the moment. I am with my feet up at the inn waiting on the snow to clear. Or I could get a shovel and start digging my way out. In order to do that I need a shovel, some wet weather gear, a thermos of hot tea and patience. I could have been digging daily so that the snow didn’t build up in the first place. But hindsight is a wonderful thing. I could just wait till spring and enjoy curling up with my kindle and watching the flames of the log-burner. Even making a fire needs steps broken down. What do you need? Newspaper, kindling, smaller logs, larger logs, matches, hand fan. How do you build a fire up? Layers, newspaper, stack kindling on top of the newspaper, place the smaller logs on top of the kindling. Open the damper to allow maximum air into the log-burner. Light the newspaper in several spots. Close the door of the log-burner. Wait for the kindling to catch fire. Wave the hand fan if needed. Add larger logs once the smaller logs are well lit. Add logs as needed. Writing out the steps to achieve your goals makes achieving them manageable and it allows you to SEE how to get there. If one way doesn’t work, try a different route for your steps. This is a challenge for me sometimes, priority. It is easier to do low priority stuff than high priority usually. But if we break down the high priority tasks into smaller tasks then the tasks will appear more manageable and less daunting. Working out how to tackle a plan can make a difference between starting or abandoning it. Try having a Photoshopped finished goal for your desk if appropriate. For example: Photoshop yourself recieving a prize for your artwork. Superimpose your artwork onto the winning frame and Photoshop yourself into the recipriants body. I do not multitask. I think it allows you to do all things poorly. I would rather do one thing at a time and one thing well. It helps with concentration. However sometimes it is better to do something poorly than never have tried though. Life is never black and white, it tends to be a lot of gray. When we reach a goal we can sometimes feel elation followed by deflation. While on the journey we can see where we will end up but not how. Once we have reached “there” we have nowhere to go next. It’s a bit like getting to end of a good book. Satisfied, disappointed yet a little bit of angry that there are no more pages to read. Selfish thoughts really. That is where the next goal comes into play. And the race is off again and the journey to reach the next goal. I think I have given myself enough work to do with getting back on track with my goal cards. I wrote the steps down and saved them onto my computer. What the file name is, I have no idea, well maybe some idea. Having a paperless room is great in theory but if it is anything like my floor at the moment I cannot see how I will be able to find things. I am yet to be paperless but I hope to be despite my reservations. Not being able to see the paper will be enough reward. My goals are not broken down well enough, time to address the problem. I think I have plenty to do. Revisiting what I write down is important. I may need to rewrite the ideas again to feel it. I need reminders. I need prodding. I also need to remember that sometimes I slip back into bad habits. This is normal. Gently guiding myself back to the right path is needed constantly until the new good habit is formed. But again I slip again and again. Sometimes I don’t want direction and that’s okay. All in good time. Sometimes I need rest. Sometimes the goals are wrong too. Sometimes they need to be dropped. Deciding. It’s part of life. Perfection is not. Perfection is in a sunset or a leaf. I’m looking for contentment and peace of mind. And to be perfectly honest the exercise at the moment is not working as I had hoped. I am trying but it is like trying to get a cat into a bath. I am going to try walking with headphones. So let’s say half an hour, 3 minutes a song, I need 10 songs with good tempo. What’s a good songs to walk to? If you are unfamiliar with Audio CAPTCHA* here is a sample of what you might hear. I helped out someone last week with their email. They had forgotten their password and couldn’t get into their email account. I ended up speaking to someone from a call centre and being guided through the steps to get a new password. One of the steps was a stumbling block. The visual CAPTCHA. The sample above is a basic form of visual CAPTCHA, a moving collection of numbers and/or letter without regard to letter casing. Mine were nothing like this. Mine were out to fool the smart bots. There were background letters and numbers like in a stream, they were the water and the letters/numbers I had to write down were the stationary fish bobbing in the water. I tried eight times while I spoke to the call centre representative. And eight times despite entering the correctly matching letters/number the response from the website was “Incorrect code. Please enter the correct code.” Each time I grew frustrated yet outwardly calm with the representative and each time telling her that the response was the same. She suggested that I was entering the code incorrectly. No, I wasn’t. Then she tried it from her end. She discovered that what I had been saying to her was correct. The CAPTCHA generating tool wasn’t working. It didn’t work for her either. No kidding. That was what I was telling her all along! Meanwhile there was an audio CAPTCHA option that I thought might be easier than the visual option. I couldn’t do it at all. Let me describe it to you if you haven’t clicked the youtube video. You are listening to three possibly four conversations at once. In my case I had to isolate the child’s voice who was listing numbers while the other conversations were going on at the same time. I could hear maybe two numbers, but I couldn’t tell if I had heard the first number or the third number or anything really. It was a garbled mess of words and numbers. I failed badly. I suspected that even if I got the correct number by chance the website would tell me I was wrong anyway. However I knew I would never get it. Audio was not possible, visual options were the only way. But Visual wasn’t working. The representative decided that she would work from a different computer console and she would call me back. She kept her word and called me back as promised. She also successfully allowed me to change the password. Mission accomplished! Hurrah! Do you dream of electric sharks? Why do we have an abnormal fear of sharks? The chances of dying by shark is much lower than say by slipping in the bathtub. The film Jaws hasn’t helped this fear. That theme music is enough to have you running for the sand dunes. New Smyrna, Florida in the US is considered the most dangerous place in the world for shark attacks, in 2013 there were 53 shark attacks in the US, most were in Florida and California, states with long coastlines and warm waters. Western Australia is the most dangerous in Australia. In Hawaii if you watch the locals, the only activity they seem to do at the beach is have a bbq. We asked them. They don’t tend to swim. Only tourists seem to venture in. If the locals don’t swim and splash about there is probably a good reason not to do so either. Anything can happen. Sharks maybe the first thing on your mind as you enter the water but there are things far more life threatening. Oh and just wading in the ocean can be just as dangerous as out deep. The statistic for Mexico was a woman standing in the shallows while feeding fish in Quintana Roo. She fortunately survived. There may be sea snakes, barracudas, jellyfish, or any number of sea creatures or broken glass. You may cut yourself on coral. You may get sunburn. You may get swept out by a wave. You will get sand in places unpleasant. Watch out for sand rash! 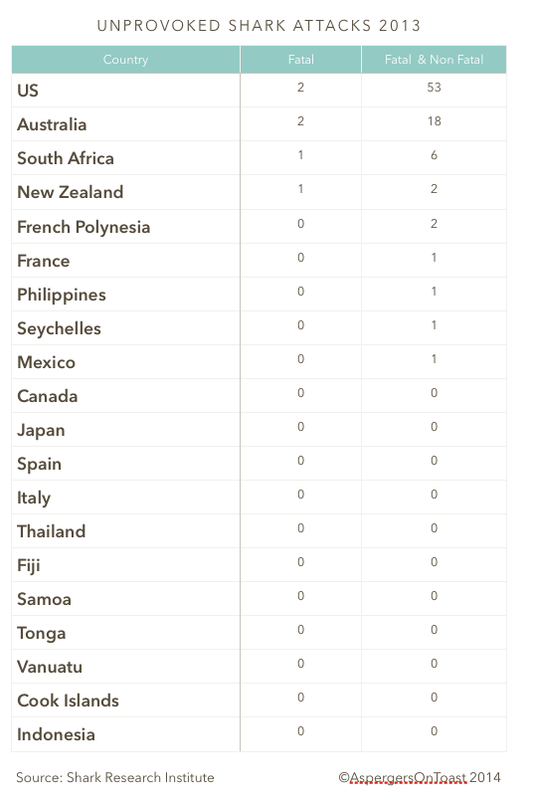 Nil unprovoked shark attacks for the Pacific Islands and Asia. On first thoughts great but over fishing of sharks for their fins for soup or dumplings, and sharks getting caught in commercial fishing nets are probably the cause of the decline in numbers. If you decide to enjoy the wonders of the ocean be safe and enjoy. Remember to slip slap slop*! Enjoy the sunset. Enjoy the colours. Leave only footprints in the sand. Go visit an aquarium and view the sharks from the safety of toughened glass. Or scroll through videos of jellyfish. Growing up in New Zealand the fish in the “fish and chips” was commonly shark. Nowadays the fish is either snapper or cod. If you insist on entering the ocean water to go surfing, wake boarding, swimming or diving then these scientifically researched wetsuit designs by Hamish Jolly from Western Australia may save you. When I was small, before the time when I could butter my own toast, one of my parent’s would do it for me. If the toast was “broken” in anyway I would have a tantrum. The toast had to be whole. You know when toast is overcooked or it sits out too long and gets hard and brittle, well I didn’t like that at all. I would show my dislike the only way I knew how, a tearful scream and shout. Later when I could make my own toast I could be prone for a tantrum too. When visiting my grandparent’s house I would make sure I was up and ready for breakfast with grandad as he had a habit of making all the toast at the same time and placing it on the table in a rack. It was cold and brittle by the time you got to eat it if you were slow getting up. In those days bread was toasted on the grill of the gas range. 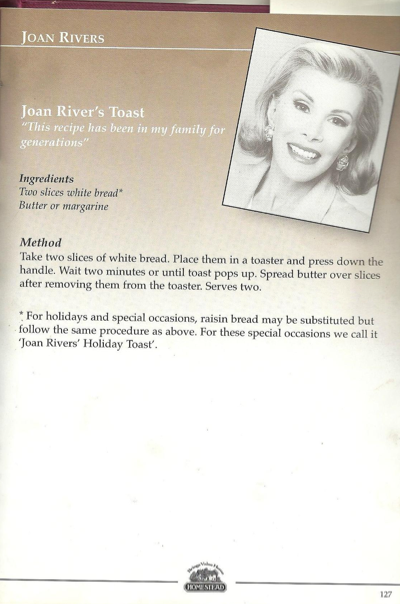 Later they had an electric toaster with one heating element in the centre with two flip down sides, the toast had to be turned over to get both sides toasted. I would listen for the sound of door to the kitchen being opened and grandad walking around. I was always prompt for breakfast. Scenario 1: The toast broken while spreading butter or Vegemite or jam or peanut butter. Result: Extreme chance of a tantrum, prepare for loud noises. Suggest to under cook toast. Scenario 2: The toast broken while cutting the toast in half. Result: Extreme chance of a tantrum, prepare for loud noises. Suggest to use a sharp knife when cutting. Scenario 3: Toast prepared and cut without breaking. Followed by toast being eaten. Odd Conclusion: Toast bitten and chewed does not appear to cause tantrums despite the fact that the toast is no longer whole. I am not proud of my tantrums but they were a part of me. I do not deny it ever happened. I wish instead to thank my parents for their limitless patience with me. I no longer have tantrums when food is broken but I feel much happier when the food remains whole until I am ready to eat it. Interesting Toast Fact: The term toast comes from the Roman practice of dropping a piece of burnt bread into the wine. This was done to temper some of the bad wines the Romans sometimes had to drink….The charcoal actually reduces the acidity of slightly off wines making them more palatable. 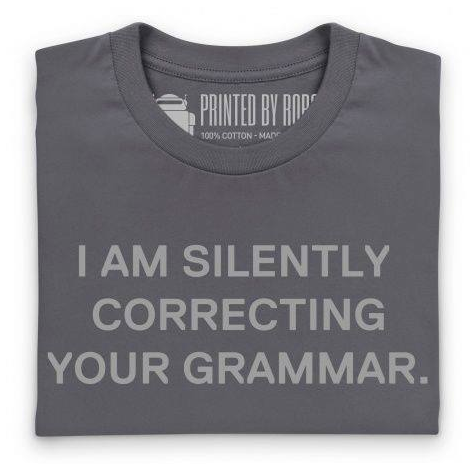 I am silenty correcting your grammar. Ted Talks Sir Ken Robinson Do schools kill creativity? Watching Ken Robinson’s talk got me thinking about education and schooling. Hence the graph and rankings of high school teacher salaries in various countries in my previous post. We have all journeyed through the school system, whether we were first students, later to go onto becoming teachers or the groundsman or janitor or a member of the Parent Teachers Association (PTA). We have all had numerous experiences, some good, some great, some bad, some horrendous, some life changing. We all have an opinion on the school system. Subjects that your parents were taught might be the same as when you went through but the content will be completely different. Some subjects are now considered obsolete and dropped from the curriculum, others on trend are brought into the fold causing panic among staff who have to up-skill in order to teach the subject with their freshly learned knowledge. Some subjects are now thankfully available to both sexes. The jargon may have changed since you were in a uniform or not, but the basics have not changed. We go to school to learn an education, to run and jump around, to learn how to communicate with others in our same age group and get a piece of paper at the end that lets you know what you may or may not be able to do next. Can education be improved? Of course. Can our educational journey be more crafted to our own individual needs than those of a group? For sure. When you were 5 years old what technology or gadgets were in your house to ease the load? Did you have a colour television, a kinetic watch, a microwave oven, a cellphone, automatic transmission car, an automatic vacuum cleaners? If you grow up with a technology you are familiar with it. It’s there. You know instinctively how to use it because you have watched someone else use it before you or you have had time to play or fiddle with it yourself. My brother and I had a brilliant idea to get our grandmother a microwave oven to help her out in the kitchen when she was still living in her own home. Grandad had already passed away and she was living independently. She was beginning to find cooking a challenge. Our idea was a microwave oven as a solution. We thought that that would be safer than leaving something on the stove to potentially burn down the house. We picked it out, we brought it around. We proudly showed her how to use it. She smiled. We left. It never got used. The intentions were good but the idea was wrong. She had never used a microwave her entire life and she didn’t feel comfortable to cook a different way so late in life. We could have bought one earlier for her but I think the outcome would have been the same. Our ideas of cooking and comfort were different and she was beyond the concept of new technology to help. Sometimes we enjoy standing at a stove and stirring a pot, it gives us time to think, we cook two things at once, ideas and food. Things were done from scratch with my grandmother. There were no shortcuts in her life. To expect someone to change their way of thinking so late was naive on our parts, but we showed we cared the best way we could. It’s the thought that counts, right? That’s debatable. Why is it that we have to sit in a classroom with our peers and learn at the same pace as others. Why must we sit in a classroom? Why must we all learn English at 9am on a Monday morning, and again Tuesday afternoon at 2pm. Why do we have to be with so many people? Why do we have to learn Mathematics? Because. Why can’t we do what we like when we like? Well that’s the way it is? Sound familiar. Montessori schooling is freer in concept and has been around since 1907 in Italy, introduced into the US in 1914, but actively embraced from the 1960s. Sweden has schools without classrooms. See article here for the look, and here for their concepts. Is this the way of the future? Do we need physical schools at all? Why can’t we learn from home at our own pace? Distance learning has been around for a long time, people in isolated areas had no alternative, there were no schools. Students would receive packets in the mail and the parents would help with their children’s lessons. Using the kitchen or the home as the classroom. Communication with the teacher was through mail. Internet speeds up distance learning, communication can be via email, Skype, or other software. The pace is set by you, the organisation is up to you. Will this be the norm? We can be studying Latin at university level, while at the same time doing Mathematics at the same level as your peers, you can be doing anything! Your imagination is your only limit. When we have limitless choices how do we decide what we want to do or what to study? I suppose we must follow our heart. Go where the interest takes us. We need to do the basics. Reading, writing and mathematics. And then after that we can explore these areas further or run off at tangents into biology, music, mechanics, languages or art history. We cannot form an opinion based on nothing. We need knowledge to form one. The wider the base the sturdier the tree. We need to consume knowledge to make better decisions. Curiosity is a trait that needs to be cherished and let loose. The inner child also needs to be brought out and sat on our knees and explore the world together. Why should we hide the inner child under the stairs. Why can’t we giggle and run and shout when we find something that tickles our fancy. Why have we confused the meaning of growing up and maturity. Why must we let our minds become rigid? We can still be free in our minds, we can be young at heart at 80. The inner child knows no limit, why should we? Our joints may become stiff and creaky as we get older but we can encourage movement with exercise, swimming, walking or other. So too can our minds become stiff and rigid as we mature. We don’t have to be that way. We can remove the layers of useless rules we have placed on ourselves and begin to run in our minds like the carefree child we once were. Maturity means fully developed, ripe or reaching a due if you use the financial term. It also means to be able to take care of yourself in all that it encompasses, emotional health, spiritual well being, worldly, financially and legally. It is a life long journey and one that is not determined by a certain age unless we are talking about legal ages for driving, marriage medical decisions. May we never sacrifice curiosity in the name of maturity. Long live curiosity! Stop thinking about the cat!